Given a choice, male dyeing poison frogs snub empty pools in favor of ones in which their tiny tadpoles have to metamorphose into frogs in the company of larger, carnivorous ones of the same species. The frog fathers only choose to deposit their developing young in unoccupied pools when others are already filled with tadpoles of a similar size as their own. These are seemingly counterintuitive decisions, given how often cannibalism involving a large tadpole eating a smaller one takes place in natural pools, writes Bibiana Rojas of the University of Jyväskylä in Finland. Her findings are published in Springer's journal Behavioral Ecology and Sociobiology. 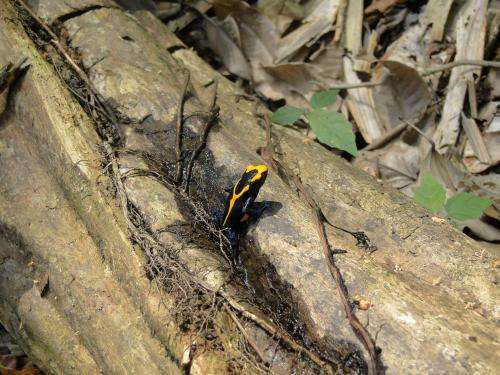 Rojas studied a population of dyeing poison frogs (Dendrobates tinctorius) in the forests of French Guiana. In nature, these frogs lay clutches of four to five eggs. When hatched, the males carry the tadpoles to water-filled cavities in treeholes or palm bracts. Once at their rearing site, tadpoles remain unattended but also unable to leave, until their metamorphosis about two months later. Choosing good places to deposit tadpoles generally has direct effects on fitness or the continuation of a parent's genetic line. This is because the conditions that larvae experience affect their survival and their life history in terms of the time and size at which metamorphoses takes place. Rojas found, if given the choice, male dyeing poison frogs prefer taking their newly hatched tadpoles to pools already occupied by larger conspecific larvae – this despite the high risk of cannibalism. She believes that the presence of a larger conspecific tadpole is a signal to frog fathers that conditions in a specific pool are conducive to larval development. Also, parents might have little choice other than depositing their tadpoles in already occupied pools because so very few suitable ones are around. "The presence and the size of conspecifics influence parental decision-making in the context of choosing a rearing-site for their offspring," says Rojas. "Apparently strange parental decisions, such as depositing offspring with large cannibals, may ultimately not be that strange. The researcher continued, "The decision is like a gamble for the frog father! Chances are that its tadpole gets eaten by a large resident in an occupied pool, but an unoccupied pool might mean, for example, that other requirements for development, such as the stable presence of water, are not met. If the father is lucky and its tadpole is not eaten, it may ultimately be safer in a stable pool than in one that could easily dry out." Whatever doesn't kill ya, makes ya stronger. It could also be that he is feeding his older progeny with younger ones. The researcher has certainly considered this, but it is not clear if the test were performed to answer that question.